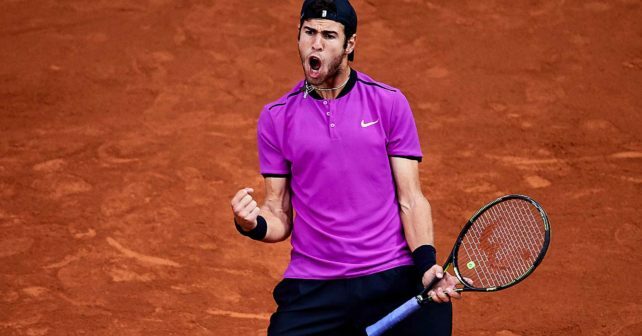 Karen Khachanov is a promising 21-year-old Russian tennis player who just beat Tomas Berdych in the French Open. What racquet does Khachanov use? Khachanov is using the Wilson Blade from 2015 with 18×20 string pattern. Weirdly, Wilson hasn’t given him a paint job version of his racquets for the French Open and so he’s endorsing an older model than the current line with Countervail or the limited edition with reversed colours (read a review for the Wilson Blade with Countervail here). It is even weirder that he was using the Wilson Blade Countervail paint job earlier in the year as you can see in the below paint job. Does this mean he tried the new Countervail series but didn’t like them or that he’s superstitious or is his racquet really a pro stock version, for example a Wilson H22? If you want to know more about pro stock tennis racquets, I suggest you read this post. Luxilon ALU Power at 25/23 kg. A lot of pro player racquets are a complete mystery since it is rarely what you see, but what is underneath the paint. If you want to read more about the racquets of the ATP professionals, I suggest this post. I got a question about Khachanov’s dampener and can report that he’s using a green Kimony Quake Buster. 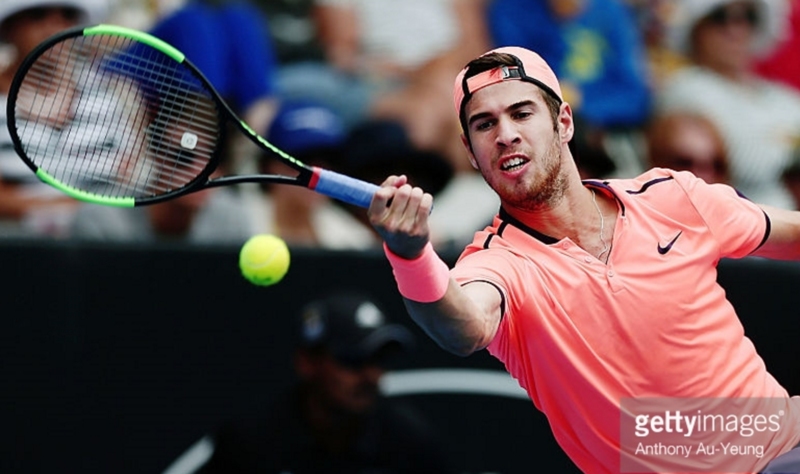 Karen Khachanov is currently ranked 53 in the world and has won one ATP title in Chengdu last year. If you’re interested in the Wilson Blade 98 or another tennis racquet, below are some articles to get you started. Here is a great racquet buying guide to get you started. What tennis racquet should I buy? By seeing his rackets in RG’s stringin room, I am pretty sure he is actually using at is a H22. I would say that he tried the New Countervail tech and did not like it, so he came back to his old ones. Thanks for your comment! Sounds reasonable enough. H22 is a popular Wilson pro stock. Does anyone know which vibration dampener Karen Khachanov is using ? For t-shirts (EU) and tennis racquets – click here. Tennisnerd is all about tennis with a focus on tennis gear such as racquets, strings, tennis shoes and gadgets. On Tennisnerd you'll also find info about the game in general with tournament and match previews, player articles, predictions and tennis instruction. 2018 All Rights Reserved Tennisnerd.